Now that you understand how to develop an ecological task analysis and have an understanding of motor behavior concepts across the life span, you are invited to take these concepts and apply them to the following case studies. 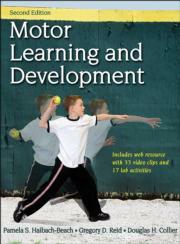 Motor learning is a subdiscipline of motor behavior that examines how people acquire motor skills. Motor learning is a relatively permanent change in the ability to execute a motor skill as a result of practice or experience. Instructors of physical skills sometimes teach with a template in mind (e.g., the movement pattern of a highly skilled athlete). After all, doesn’t it make sense to imitate the best? Motor Learning and Development, Second Edition With Web Resource, provides a foundation for understanding how humans acquire and continue to hone their movement skills throughout the life span.